Using a state-of-the-art data assimilation system and surface pressure observations, the Twentieth Century Reanalysis Project is generating a six-hourly, four-dimensional global atmospheric dataset spanning 1851 to 2014 to place current atmospheric circulation patterns into a historical perspective. 20th Century Reanalysis and PSD: Until recently, the earliest reanalysis product started from 1948, leaving many important climate events such as 1930's dust bowl droughts uncovered. To expand the coverage of global gridded reanalyses, the 20th Century Reanalysis Project is an effort led by PSD and the CIRES at the University of Colorado to produce a reanalysis dataset spanning the entire twentieth century, assimilating only surface observations of synoptic pressure, monthly sea surface temperature and sea ice distribution. The observations have been assembled through international cooperation under the auspices of the Atmospheric Circulation Reconstructions over the Earth initiative (ACRE), and working groups of GCOS and WCRP. The Project uses an Ensemble Filter data assimilation method which directly yields each six-hourly analysis as the most likely state of the global atmosphere, and also estimates uncertainty in that analysis. 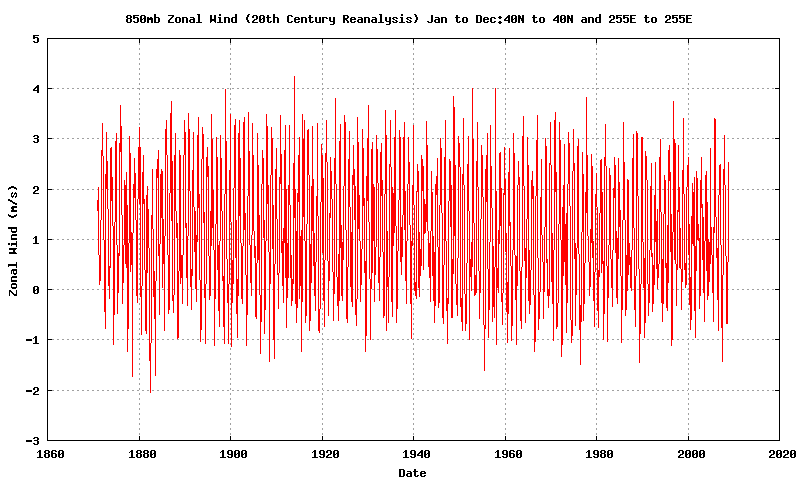 This dataset provides the first estimates of global tropospheric variability spanning 1851 to 2012 at six-hourly resolution (V2c). Fields from 1851 to 1860 are a first attempt at this period and will be improved in future versions [Opportunities for Improvement]. Fields from 1861 to 2014 are most relevant for climate and weather studies. There are two previous versions of the 20CR. Recreating the Knickerbocker Storm of 1922: One of the deadliest snowstorms in U.S. history was the Knickerbocker Storm, a slow- moving blizzard that occurred on January 27-29, 1922 in the upper South and Middle Atlantic states. This storm was named after the collapse of the Knickerbocker Theater in Washington, D.C. shortly after 9 p.m. on January 28. The movie theater's flat roof collapsed under the weight of 28 inches of wet snow, bringing down the balcony and a portion of the brick wall and killing 98 people, including a Congressman. An arctic air mass had been in place across the Northeast for several days before the storm, and Washington had been below freezing since the afternoon of January 23. The storm formed over Florida on January 26 and took three days to move up the Eastern Seaboard. Snow reached Washington and Philadelphia by noon on January 28 and continued into the morning of January 29. Winds gusting up to 50 mph created blizzard conditions, and heavy drifting blocked roads for days. Railroad lines between Philadelphia and Washington were covered by at least 36 inches of snow, with drifts as high as 16 feet. Figure above presents data from the 20th Century Reanalysis Project's three- dimensional reanalysis of conditions at 7p.m. on January 28, 1922. With data like this available for the entire 20th century, climate researchers hope to improve their models so that they can more confidently predict regional weather trends for the future. * Source: SCIDAC Review, Spring, 2008 http://www.scidacreview.org/0801/pdf/climate.pdf. The Science on a Sphere project has available 3 animations created using the 20th Century V2 precipitable water data. They are the Galveston hurricane of September 1900, the 1917 La Nina transitioning to the 1918 El Niño and 1902-1903 (where the location of the Discovery ship is marked). Users can view these on a 'Science on a Sphere' exhibit and can download the animations from the Science on a Sphere 20th Century Reanalysis webpage. 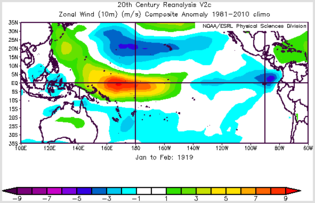 NOAA/ESRL PSD 20th Century Reanalysis version 2c data documentation page. 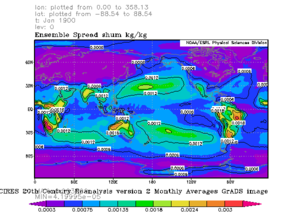 NCAR 20th Century Reanalysis version 2c data documentation page. NERSC Science Gateway to 20th Century Reanalysis version 2c selected ensemble member fields. Earth System Grid Federation Ana4MIPS: Easy access to netCDF reanalyses data of selected variables corresponding to the CMIP5 climate model output. 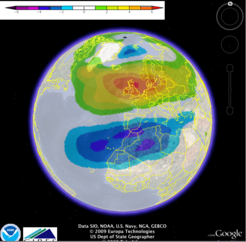 NOAA/ESRL PSD 20th Century Reanalysis version 2 data documentation page. 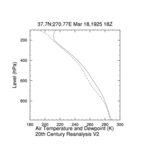 NCAR 20th Century Reanalysis version 2 data documentation page. The Centre for Environmental Data Archival now has a copy of the 20CR dataset. NERSC Science Gateway to 20th Century Reanalysis version 2 selected ensemble member fields. A subset of the V2 dataset is now available via the Earth System Grid Federation (ESGF) NOAA/ESRL Node (where CMIP5 data is also available).The URL is http://hydra.fsl.noaa.gov/esgf-web-fe/. Click on "Search" and you can find it by using the search term "reanalysis". 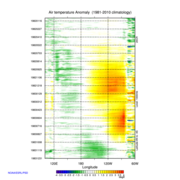 NCAR 20th Century Reanalysis version 1 data documentation page. Technical documentation for T382 Global Forecast System. Plot, analyze and obtain various ocean and atmospheric indices including the the North Atlantic Oscillation (NAO), the Arctic Oscillation (AO) the SOI and many others. The Twentieth Century Reanalysis Project used resources of the National Energy Research Scientific Computing Center managed by Lawrence Berkeley National Laboratory and of the Oak Ridge Leadership Computing Facility at Oak Ridge National Laboratory, which are supported by the Office of Science of the U.S. Department of Energy under Contract No. DE-AC02-05CH11231 and Contract No. DE-AC05-00OR22725, respectively. Papers using the Twentieth Century Reanalysis Project dataset are requested to include the following text in their acknowledgments: "Support for the Twentieth Century Reanalysis Project dataset is provided by the U.S. Department of Energy, Office of Science Innovative and Novel Computational Impact on Theory and Experiment (DOE INCITE) program, and Office of Biological and Environmental Research (BER), and by the National Oceanic and Atmospheric Administration Climate Program Office." We would greatly appreciate feedback on its use; in the classroom, for presentations or for research. Mail to PSD.data at (esrl.psd.data@noaa.gov). 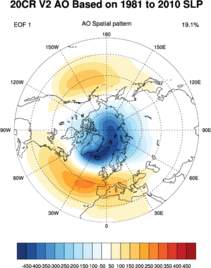 Please use these pages below to plot the 20th Century Reanalysis Version 2c and 2 of the data. Additional tools will be forthcoming. Clicking on graphics will show full sized images of the example plots. Clicking on the plotting tool descriptions,e.g., 1) Monthly Composites, 2) Monthly/Seasonal Google Earth Interface, 3) Sub-Daily Average Composites, and 4) Monthly/Seasonal Google Earth Interface will show respective plotting tool pages. You can also use the PSD Search and Plot page. This is less flexible but can access all the data. Search for dataset(s) 'NOAA-CIRES 20th Century...'. For a selection of meteorlogically based applications that can read and analyze the 20CR netCDF files, see the netCDF display and analysis tools page. Google Earth: The NAO and anomalous winter 850mb zonal winds. for the tropical Pacific area for 1982-3. FTP: Data is available via anonymous ftp. For specific details, see the data documentation. Go to "pressure or monolevel" link and there is a list of variables. Or, go to "search and plot" and search for dataset NOAA-CIRES 20th Century Reanalysis V2c and the variable(s) you would like. Additional ftp help is also available. OPEnDAP: Data can be read directly via OPEnDAP. See the data documentation: File naming, OPeNDAP name from the data documentation webpage. We also have help on OPeNDAP and the applications that use it (GrADS, NCL...). OPEnDAP: NetCDF-4 files for every member of selected variables are available from the NERSC Science Gateway. wget: GRIB files for every member are available from the NERSC Science Tape Gateway. 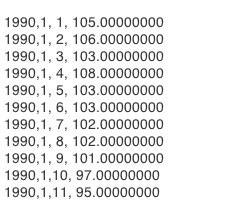 wget: GRIB files or netCDF for the ensemble mean and ensemble standard deviation are available from NCAR. Information about the input pressure level data, what was used to prescribe the boundary conditions, the model run, and similar details can be found on the dataset doc pages for 20CRV2 and 20CRV2c.